Wanda Maria Designs: "art quilts"
Trip to Chicago - Grandmother's Garden Quilt and Imported Food Galore! On another note, I was born in Chicago and I lived there until I was eight years old. Because I still have family there, I like to visit there every now and then. One of my favorite things about Chicago (besides my family, of course) is the vast assortment of ethnic food available to consumers. You name it - they've got it - regardless of the culture. Packages of sauerkraut imported from Poland. Who would have thought there were so many varieties? Matzo ball soup mix made by Lipton. Who knew??? Seasoning mixes from Poland for every kind of dish imaginable. A full aisle dedicated to olive oil from Italy and all sorts of vinegars known to man. Amazing! And let's not forget the magazine section so you can keep up on all of the latest news and gossip. Mustard from Poland to go with all of the deli meat I purchased. Vanilla sauce mix, vanilla sugar, vanilla and almond extracts from Europe just in time for my holiday baking. Can you tell I LOVE vanilla? Every year during the second week of October, Northwest Arkansas is abuzz with thousands of out-of-state visitors. The reason? It's craft fair week. There are numerous fairs which take place for 2-4 days each. It's literally a haven for those who want to experience arts, crafts and shopping in a beautiful autumn setting. This year was no exception. This year, I decided to take a week of vacation during craft fair week to make the most of this experience. Of course, on the days preceding the fairs, I made the most of my time by quilting and spending time with my family. One of the quilting projects I completed was a split nine-patch quilt top. I saw one of these quilts on my latest addiction, Pinterest, and KNEW I had to make one. The color choices of green and orange are not colors I normally gravitate to when quilting, but for some reason, I couldn't resist. A local shop was selling the bright and cheery fat quarter pack containing these colors and I knew it would be perfect for the split nine-patch quilt. To really make the colors pop, I added white and darker green fabrics from my fabric stash. Now, I'll be honest, some of my blocks on the quilt turned out a bit wonky, but I don't think it was too bad - all things considered. I also completed a Trip Around the World quilt for a gal I work with as a gift for her unborn baby. The baby - who is a boy - has a nursery decorated in retro colors of forest green, olive green, brown and a splash of burnt orange. I decided to make the quilt so it would complement the colors of the nursery. My co-worker received the quilt at her baby shower this past weekend and loved it. I absolutely adore quilt making. 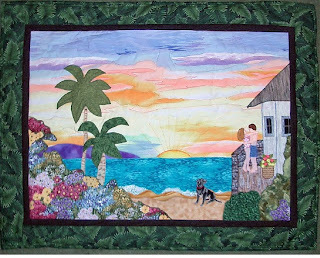 I remember the days when I used to quilt for hours at a time. Since my jewelry designs have taken off at the boutiques and on the internet, I don't get to quilt as often as I'd like to. However, I recently had some vacation time from work which I used to work on some mini crazy quilts. All 10 of them (yes, 10!) were made from vintage hankies. 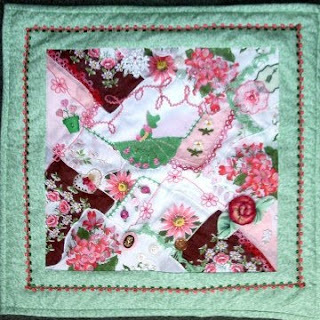 These quilts were inspired by Cindy Brick, who came up with the concept of "Hanky Panky Quilts". I became hooked on this concept ever since I bought her book years ago. It is still one of my all-time favorite quilt books. Happy New Year - Back in Action! I know I have been away from my blog for a long time. I promise to try to stay on track and keep regular posts coming. One of my major resolutions this year is to be more disciplined in some areas. I have some definite goals in mind and God willing - I will stick to them. 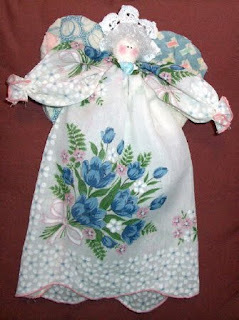 In regards to the arts and crafts world, I would like to get back into making art quilts and dolls. Quilting has always been one of my favorite things to do. I got so caught up in making jewelry for my customers, boutiques and the like that it took up all of my creative time. Don't get me wrong - I'll still make and sell jewelry as long as there is still a demand for it, however, I'd like to get back to doing what I really enjoy. For years, I have hoarded vintage quilts, chenille blankets, linens, hankies and doilies with the intent that I would make them into something new. I did make some awes ome hankie quilts, hankie angel dolls and ted dy bears made from chenille blankets and cutter quilts a few years ago. 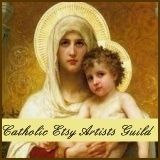 Please keep an eye out for my new creations which I will sell on EBay and Etsy. This is going to be an interesting year! Speakin g of hoarding, I have collected vintage brooches, earrings and broken jewelry pieces for years. 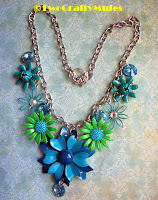 I have also been experimenting with creating these into repurposed assemblage necklaces. These are a nice change in design for me and quite refreshing.